Junk Car Buyers in Greensboro NC. 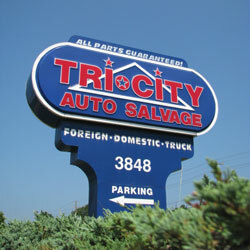 Tri City Auto Salvage. Thank you for choosing Tri-City Auto Salvage! We offer a huge selection of used car, truck and SUV parts for both domestic and foreign models and we will gladly buy your wrecked, salvage, junk or unwanted vehicle for recycling. Family owned and operated through four generations, we have always judged our success by great customer service. For us it’s not about just selling parts, it’s about offering quality solutions for our customers and that includes buying your 2000 and newer salvage or junk cars. Our used parts sales office and salvage yard are conveniently located in Greensboro, NC so please stop by or give us a call today! Junk Car Buyers NC is part of the Automotiveinet business network. It offers tips and guidance to consumers looking to sell wrecked, salvage or old junked cars for cash as well as offer contact information to the top junk car buyers in NC. Junk car buyers NC is NOT a car broker site and does not charge a fee for referrals. Find junk car buyers in NC, Raleigh, Charlotte, Greensboro, Durham, Cary, Goldsboro, Winston-Salem, Fayetteville, Wilmington, High Point, Greenville, Rocky Mount, Wilson, Burlington, Ashvillle, Wake county and many more geographical areas. Tri City Auto Salvage, Greensboro NC.